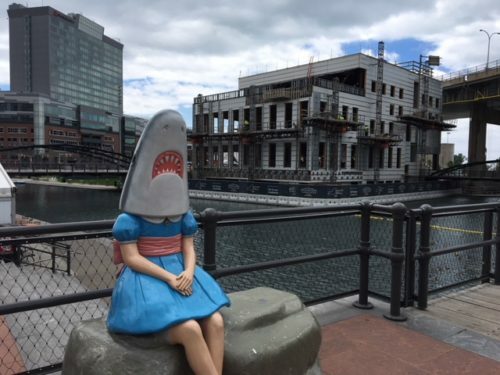 Save a seat for us Sharkgirl! We’re coming!! We are delighted with the progress of construction as our community vision takes shape at Canalside with the cladding now on the exterior of the building. We are busy planning for the next stage, which is the turning over of the core and shell of the building from ECHDC to Explore & More this summer. Once we have access to the building we will bring in the infrastructure, heating, cooling, plumbing and electrical. Exhibits will start to come in in December with installations and limited “soft opening” testing taking place December through March with an opening to the public planned for the Spring of 2019. We are so excited! We look forward to our playdate with Sharkgirl!